One area of the Transfer Station (TS) that is not like the others is the metal pile. Old white appliances are near-by and some reclaimable items are placed on the side but by and large the metal pile is not sorted. It’s a large jumble of all types of metal as well as items that are partially metal or a combination of metals. Metal often shows up at the TS as a “thing”, often manufactured, fastened, fitted, and not as easy to separate or sort. But it can be done. As with all separating, it would be good to at least get the non-metal parts off of items before we toss them into that pile. That’d be a start. Plastics, rubber, wood, and glass have no business being in the metal pile. I understand that some of these just melt away when the metal is reconstituted, but that feels like a waste. All pieces should find their recycling channel. It’s the stiffness, variety and weight of metal that makes it difficult to store. Metal doesn’t stack! Staff at the TS do take things apart when they have time. I remember last summer, the mattress-bee when the plastic, cloth, wood and metal springs were separated along with the hide-a-beds and the lawn chairs and other composite items. But this isn’t part of their main job. It might look like a big pile but the volume at the TS is not significant enough to separate various metals and it is complicated further by the different finishes on metal – like paints and galvanization. The TS does not have the volume or resources to manage metal. It is just stock piled. When the pile is maxed out, the Department of Community Services hires a contractor to collect the metal from all the Yukon community landfills/TS’s every couple of years. It has been hauled south where the volume is consolidated and therefore more economical. This year, RavenRecycling.org acquired a ferrous metal compactor and so there is the potential that it might be processed here. There are four kinds of metal that we can salvage separately from this pile because they are in demand. They are aluminum, brass, copper and stainless steel (ABCs). At one time the Mount Lorne TS tried an experiment with a Yukon salvage company. There was an industrial dumpster for metal collection, but that contractor found the same problem in the cross-contamination of too many materials as well as too many types of metal. However, some metals do show up in a relatively pure form. There are four kinds of metal that we can salvage separately from this pile because they are in demand. They are aluminum, brass, copper and stainless steel (ABCs). These metals are often used all on their own to make useful items. 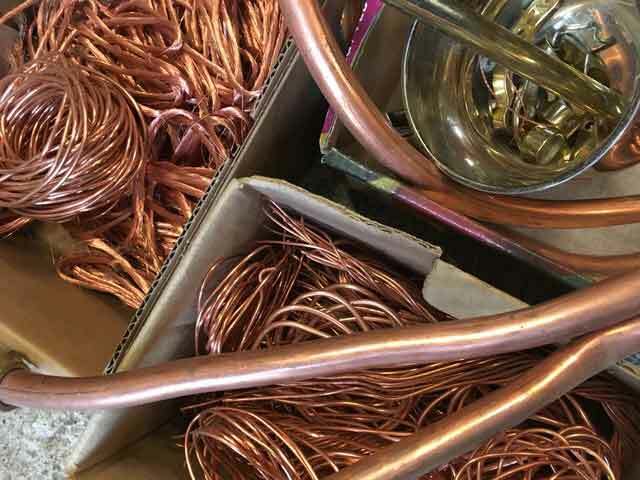 For instance, we might find copper as electrical wire, cooking pots or copper water pipes; brass ornaments, fittings and old propane lines; aluminum foil, extrusion as struts or frames; and, stainless steel utensils or maybe some hardware. They are also found as parts on other products. The TS does not reimburse for these metals but they do collect them and transfer them to Raven Recycling. The fees are quite nominal and so it’s another good way to donate so the Mount Lorne Transfer Station can keep being the Mount Lorne Transfer Station. As with all recyclables, the purer the material – the better the price. So I take the time to remove the wire insulation and other components that might be attached to the materials. Check out the RavenRecycling.org website for the price schedule. Sometimes it’s difficult to tell whether the metal is one of these four. They each have a unique colour but other metals can be painted or treated to look like one of them. A helpful test is to use a magnet. If the metal sticks to the magnet, then it is not one of these four materials and the metal can go into the metal pile at the TS. If it is not magnetic, then there’s a good chance that it will be one of these four, but staff can help you identify them. The household and clothes reuse areas are very popular, but I can’t tell you how much money I’ve saved from picking up bits and pieces of metal. I’ve found that metal is so durable that there are often secondary uses for it. Satellite dishes are good for catching rain. Frames from BBQs are good for supporting rustic (and mobile) tabletops. Iron is handy to hold down tarps. Poles and struts have multiple uses as supports. A little ingenuity can go a long way with used metal. Clearly some things are just wrecked and have to go into the pile, but I’ve taken a second look at materials in there and thought they deserved at least one day in the reuse area. The household and clothes reuse areas are very popular, but I can’t tell you how much money I’ve saved from picking up bits and pieces of metal – from reusing fasteners, perfectly good tools, pots, slightly wonky but quite fixable doodads and repurposing rebar, steel poles, fence posts, plumbing parts, sheet metal, and even gift items. I’m not a welder or a fabricator. I’m just picking and at most, occasionally using bolts or metal screws to pull things together. It took a lot of energy to mine the ore and make the metal and it’ll take a lot again to melt it down. So whenever possible, I look to reuse before I deconstruct and head for the pile.